Video: Drought plagues more than half the U.S.
Transcript of: Drought plagues more than half the U.S.
BRIAN WILLIAMS, anchor: Now to an expanding danger zone across much of the country thanks to that unusually warm and dry winter. Tonight, parts of 48 states are abnormally dry or in the midst of a full blown drought . For a lot of folks that means a high risk of fires. And for some growers, the situation is now dire, leading to higher prices for everyone at the supermarket eventually. We have our report tonight from our chief environmental affairs correspondent Anne Thompson . ANNE THOMPSON reporting: You can already see the impact of the drought . Wildfires erupting in tinder dry sections of New York , New Jersey and Florida . Low levels of water in Colorado streams where there is less snow in the mountains to melt. Today, more than half the country is dry or in drought . It is particularly bad up and down the nation's East Coast . Almost two-thirds of Georgia already suffers from extreme or exceptional drought . Mr. KEVIN MITCHUM: There's not any rain in the 10-day forecast. THOMPSON: Farmer Kevin Mitchum is watching his livelihood evaporate. Mr. MITCHUM: We've been farming pretty well my whole lifetime. And I 've never seen it this bad, not for this long. I think we in the fifth year maybe of a consecutive drought . THOMPSON: His family's worked this land for 100 years, but this year his irrigation pond hasn't gotten any water since January and he fears there won't be enough water to plant peas, the crop that provides his summer income. Outside Boston Tony Russo sells produce to markets, restaurants and consumers. Mr. TONY RUSSO: Want to see the celery? THOMPSON: This week prices of peppers from Florida doubled, where high temperatures have lowered production. Mr. RUSSO: Early concerns are always a concern in Florida about freezes in the winter months. This year it's about hot weather. So it's really an unusual situation. In fact, I can't remember conditions like this ever. THOMPSON: It's taken more than a record warm March to create this problem. Officials at the US Drought Monitor blame back to back La Nina events starting in 2010 , unusually cool Pacific waters bringing drier than normal conditions to the southern US . Mr. BRAD RIPPEY (USDA Meteorologist): We're not sure, 100 percent sure where we're going from here. We hope that it's not going to get much worse. And in fact, with the demise of La Nina , we hope that this is about the end of it. WILLIAMS: And, of course, in the Midwest they're getting too much of it tonight. Anne Thompson , thanks. 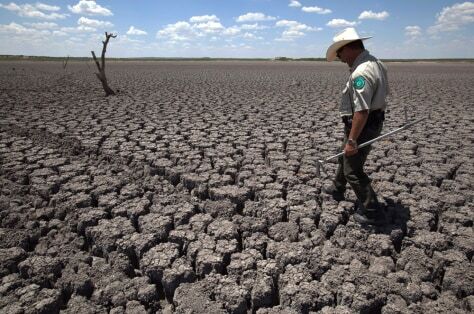 Texas State Park police officer Thomas Bigham walks across the cracked lake bed of O.C. Fisher Lake on Aug. 3 in San Angelo, Texas.